You know the old adage, never work with children and animals? Bin it. ‘Beginners’ stars a group of kids and a talking dog and it’s one of the liveliest and sharpest pieces of theatre you’ll see this year. It’s written by Tim Crouch, a wonderfully mischievous theatre-maker, and is ostensibly about a family holidaying in Cornwall – but is really about the wafer-thin divide between childhood and adulthood. It’s a properly grown-up piece of children’s theatre that reaches across the generations, makes us laugh (a lot) and touches us all. Crouch likes to tease his audience (see the bamboozling ‘An Oak Tree’ or ‘The Author’), test our senses and generally mess with our heads. The real thrill here is that Crouch applies these exact same methods to his family show and pulls it off brilliantly. 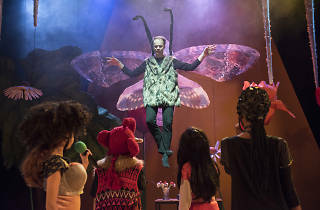 Dogs behave like humans (Amalia Vitalie is dazzling as the hound), children act like adults, adults act like children (all the cast are exquisite and Neil D’Souza a comedy genius), nightmares seep into daytime reality and – as we learn about a very sick mum in the bedroom upstairs – death begins to stalk the stage. Chloe Lamford and Camilia Clarke’s set and costumes are bold, colourful and booby-trapped. Books, towels and endless pillows (FIGHT!) plummet down from the rafters. Later – as the kids prepare a show and their imaginations take hold – giant flowers fill the stage, baby-bees buzz above us and a sparkling mountain materialises from thin air. The stage is gradually given over to the four talented young actors – Ethan Dattani, Rowan Davies-Moore, Nekisha Eric and Emilija Trajkovic – as we watch them struggle with boredom, loneliness and fear. 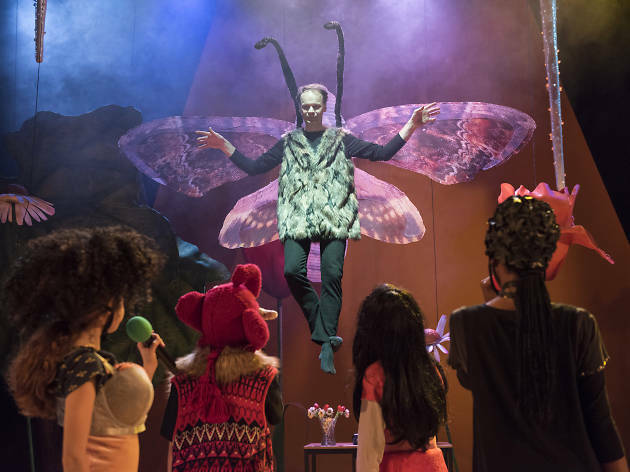 Their hopes and dreams fill the space – a ballerina leaps across the stage and a butterfly-dad hovers above – and we realise these are really our hopes and dreams, only fresher and freer. We lean in and we listen. A sweet, adorable step into the world and imagination of the ‘Beginners’. ‘Beginners’ is all about children’s dreams, our dreams and creating something magical with it. I loved this somewhat magical, whimsical play. I really enjoyed myself at the Unicorn Theatre when ‘Beginners’ was on. It was my first time to visit the Unicorn Theatre and it’s so very quaint. The children obviously stole the show as it was all about them, but there was also someone extremely special and incredible that blew me away for so many reasons. This person was ‘Sandy’ who was played Amalia Vitale. Apparently Sandy was a dog and what a great character indeed. I wasn’t aware that she was playing as a dog at first, but it then made sense. She didn’t talk, but her facial expressions and her body movements were just hilarious, authentic and so realistic. For me Amalia Vitale who played Sandy in the play was impeccable. She embodied the perfect image of a dog gracefully. I couldn’t take my eyes off of her. It’s fascinating to see how a child’s mind can develop in unimaginable ways possible. It was interesting to delve into the mind of these fascinating little humans and to see how there intelligent minds grow in time. It was truly beautiful to witness such pure talent and such pure creativity. The children were extremely professional and very entertaining I must say. A beautiful, wonderful show filled with hopes and dreams. It’s probably one of the theatre shows that makes you question life in general and why we’ve come to this messy world. ‘Beginners’ was truly sensational and incredibly funny. I couldn’t stop laughing the whole evening. It’s peculiar how the director created a harmonious twist between childhood and adulthood all intertwined into this creative masterpiece. I loved every second of the show and it definitely made me think about many important matters of life.